Secure Software Development: Is Your Team Creating Defect-Free, Low Risk Applications? What practices does your organization follow to ensure the deployment of secure software? Do developers wait until applications are deployed to perform a security assessment or repair defects? Patching is costly in the long term. Incorporating secure software development is the best approach to minimizing risk. Security can be frequently breached by both novice hackers and well-organized groups of criminals at the application layer. In some instances money is taken, and, in others, private information is leaked publicly. These actions drastically increase costs, harm reputations, and may even result in complete business failure. If your organization is not practicing secure software development, you may be at risk of such an attack. These practices ensure that vulnerabilities or defects are caught as early as possible in the development life cycle, and allow organizations to continuously mitigate risk as software is being developed or enhanced at a fast pace. A risk assessment identifies potential vulnerabilities throughout each project phase and helps the development project team determine areas requiring special attention. By following coding best practices and using static analysis, developers are less likely to make critical mistakes at the application layer, and project leads have clearer visibility to security hotspots. 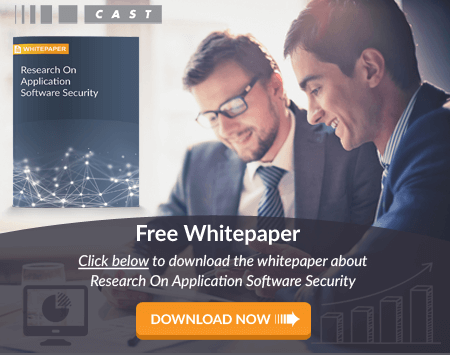 CAST Application Intelligence Platform (AIP) is an automated source code analysis solution designed for enterprise use. It is the only automated solution capable of assessing multiple languages in complex, multi-tier infrastructures. Don’t let poor structural quality, insufficient practices, or missed vulnerabilities create future problems for your organization and your users! Contact us today to learn how AIP can help your team produce solid, secure software and spend less time performing application maintenance.